Okinawa Outlet Mall Ashibinaa calls itself the ‘place for fun’ where people from the world over can gather and exchange ideas and shop. A mini-train will operate from tomorrow through May 8th during the Resort Festa. The festival runs 10am ~ 8pm, while the trains run noon to 7pm. Cost for the rides, which will extend to the end of May, are ¥200 per person. The rides begin at Ashibinaa Square. More than 70 stores fill the 20,000 square meters of shopping floor space, and a 1,000 spaces parking lot eliminates hassles of getting started. Designed with the concept of “an outlet mall with mainly European brand”, Ashibinaa rose from the ground as an ancient Greek building arranged in a modern design merged with Okinawa’s culture. The results are staggering. Ashibinaa, which in Okinawa dialect stands for a place of amity where people of all ages gather, seeks to be just that, offering events and entertainment showcasing ethnic cultures, including those of Okinawa. Ashibinaa is a unique outlet mall, offering discounts of 30~80% on more than 70 popular brands of goods. The thing to remember, mall officials point out, is that quality is high. Although prices are attractive, most of the stock is samples and items being phased out. None are damaged or lesser quality than the originals. All outlet mall shops are operated either by the manufacturers or their official dealers. 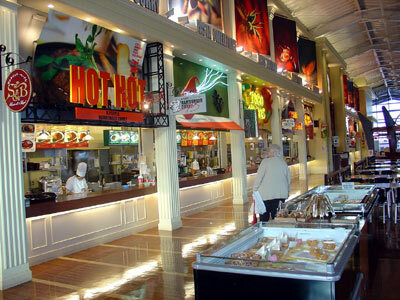 In addition to the wide range of stores, there’s a Food Court with seating for nearly 400. The half-dozen restaurants represent diversity in world cuisines, from Asian to European. There’s also a beer bar. Getting to Ashibinaa is easy. Follow signs to Naha International Airport, then continue south on Highway 331 toward Tomigusuku. After entering Tomigusuku City, with police station on the left, look for Okinawa Outlet Mall Ashibinaa signs on the right side. Turn right at the signs, then follow the road to the mall. Additional mall information is available on its website: www.ashibinaa.com. The website is refreshingly modern and stylish, and offers viewers choice of English, Chinese, Korean or Japanese.